Banana rum adds an extra tropical note to any frozen drink. 4 What Can You Do With Strawberry Irish Cream Liqueur? Banana rum combines the slightly sweet taste of light rum with the fruity flavor of bananas. Like other rums, banana rum will easily complement orange or pineapple juice. 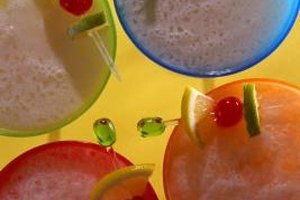 It can also substitute for light, dark or coconut rum in a variety of cocktail recipes and frozen drink mixes. A pitcher of banana rum punch will bring the tropics to your patio. Stir together banana rum, ginger ale, fruit punch, orange juice and a splash of lime juice in a large pitcher or a punch bowl. Float orange wedges, lime wedges and maraschino cherries on top. Serve over ice. Use banana rum in place of vodka to add a fruity flavor to the classic White Russian. 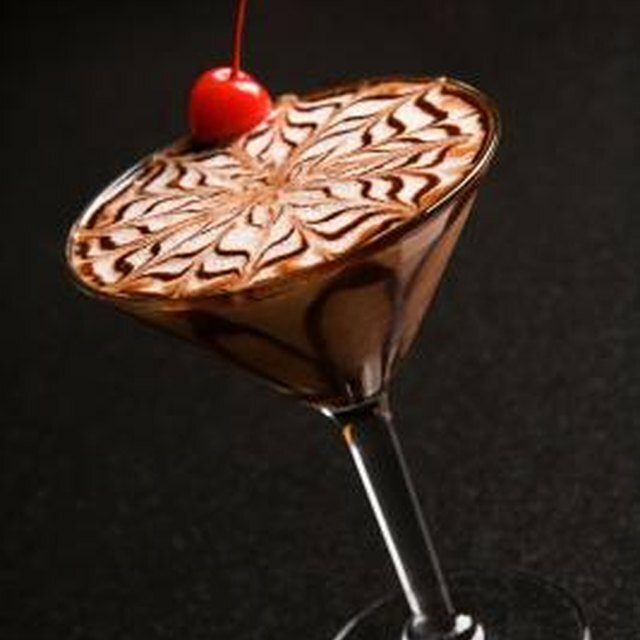 Pour the banana rum, coffee liqueur and heavy cream over ice and stir until blended. Garnish with a cinnamon stick, if desired. Use banana rum instead of light rum in your favorite pina colada recipe. The banana rum will complement the slightly sharp bite of fresh pineapple juice as you shake it with coconut cream and ice. For a frozen version, add banana rum, pineapple juice, coconut cream and ice to a blender and puree. Garnish with a slice of pineapple, if desired. Stir banana rum into sangria to add a surprise flavor to a cocktail that usually harbors only citrus notes. Pour equal parts banana rum, Cointreau (orange-flavored liqueur), brandy and a bottle of Rioja or other fruity red wine into a large punch bowl or pitcher. Add orange slices, lemon slices, fresh pitted cherries, fresh peach slices and a cinnamon stick. Chill for 8 hours. Stir in sparkling water just before serving. Garnish each glass with a curled orange peel. Use banana rum in place of light rum for a banana daiquiri that packs extra tropical flavor. Combine banana rum, triple sec, one sliced banana, lime juice and sugar in a blender with ice. Puree and garnish with a maraschino cherry.